The Spider-Armor Mark IV is Peter Parker's most powerful and technologically-advanced costume to date! Developed by Spider-Man at Parker Industries, this new spider-suit is made of light-weight, metallic liquid nano-technology, making it bullet-proof, laser-proof, heat-resistant, and capable of absorbing the impact of falling several stories, leaving the wearer unharmed. 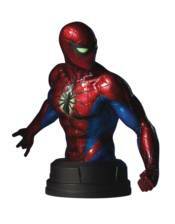 Digitally sculpted by the master artisans at Gentle Giant Ltd., the Spider-Man Mark IV Suit Mini-Bust features a metallic paint job with eyes and a spider emblem that seem to glow. Crafted using only the highest quality polystone, each limited-edition hand-painted mini-bust comes individually numbered and is packed with a matching Certificate of Authenticity. SPIDER-MAN STRACZYNSKI OMNIBUS VOL.01 HARDCOVER SPIDER-MAN VISIONARIES: JOHN ROMITA SR.